Drones are the newest, hottest, must-have grown-up toy right now and it’s not hard to see why. They’re fun and awesome to fly and you can take amazing aerial photos and videos. 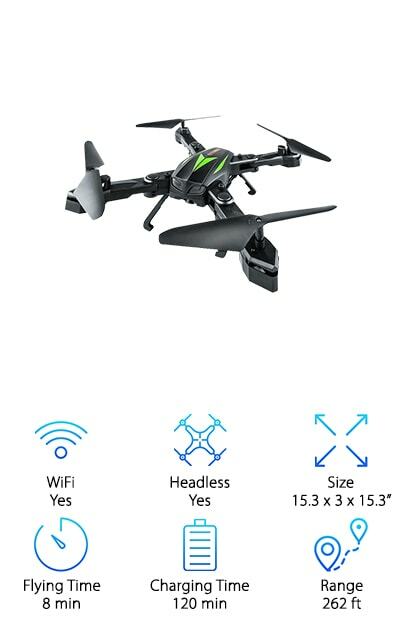 If you’re looking for the best drone camera quadcopter, you have come to the right place. We did the research and found the best products from the most popular brands. Before we jump right into our reviews, let’s take a look at some of the important features you should know. 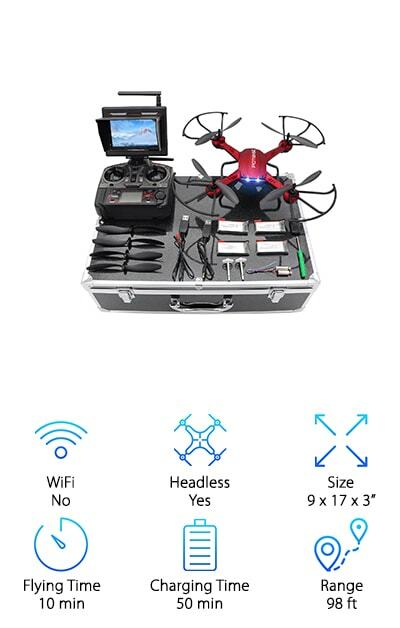 WiFi: Drones that are wifi enabled can seamlessly transport video to smartphone and tablets. Most of these drones have an app that can be downloaded and then used to fly the drone right from your smartphone. Headless: Rather than making the pilot orient with the drone, headless drones orient the drone to the pilot. You don’t need to worry about which side is the front, just which way you want to move. Size: These are all pretty generous sized drones and are so fun to fly. 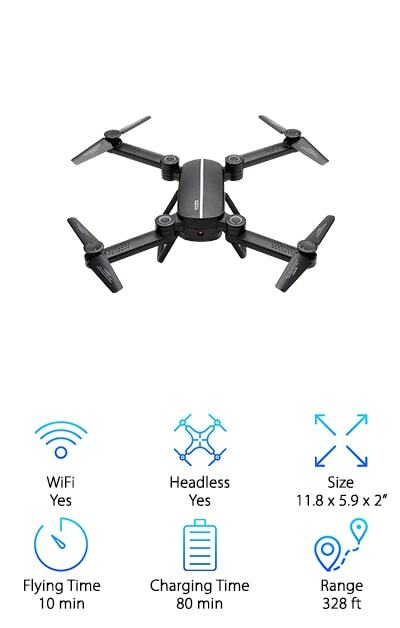 Keep in mind, if you want a smaller drone you can easily travel with, some of these drones actually fold for easy transport. Flying Time: This is the measurement of how long the drone will be able to stay flying, assuming you started with a full battery. Note this is the longest amount of flight time possible. You might get a few minutes less. Charging Time: You need a full battery to fly and this is how long it will take you to get one. Note that this number is the longest time needed to charge each one. You might not have to wait this long. Range: Range is how far the drone can travel from the signal. Look closely at these figures, there really is a wide range here. (Ha ha, get it? “Range?”) The shortest one we found is 30 meters, the longest 805. Now that you know a little more about the important features of drone quadcopters with cameras, let’s move into our reviews. Here’s how it works. Our top and budget picks are listed first. Check them out if you don’t have a lot of time. If you do have time, make sure you look at the products that round out our list. There really are some great products here and they’re all so different. Okay, let’s get right into our reviews. Our top pick for best drone camera comes from Holy Stone and we’re pretty sure you’re going to love it. It’s a great choice for beginners because it has One Key Return, which means you press one key and, you guessed it, it returns to you. Well, to the same spot it launched. The altitude hold function is great, too. Just release the throttle and the drone will hold its altitude. This is a great way to make sure you get stable photos and it’s great for flight control. Speaking of flight, it has a one-key 360 degree flip that does a continuous roll for awesome performance. Plus, it comes with a bonus battery so you don’t have to wait for a full recharge to keep flying. If you’re looking for the best affordable drone with camera, this DBPOWER MJX X400W FPV drone is the one for you. First of all, it has a WiFi HD camera so you can take pictures and easily upload and share them. Plus, you see what your drone sees when you download the smartphone app. Are you a beginner or looking for a kid-friendly option? 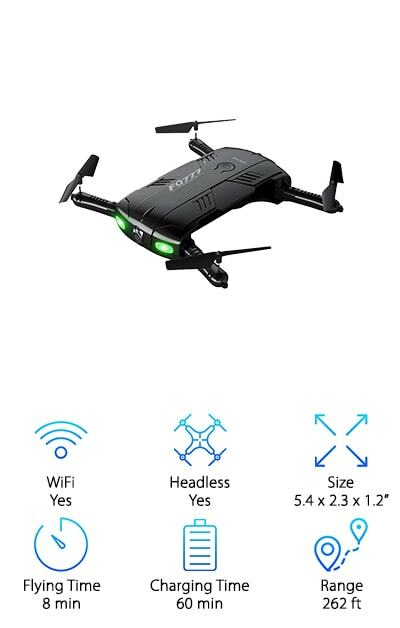 The headless mode makes this the perfect choice for new drone enthusiasts. 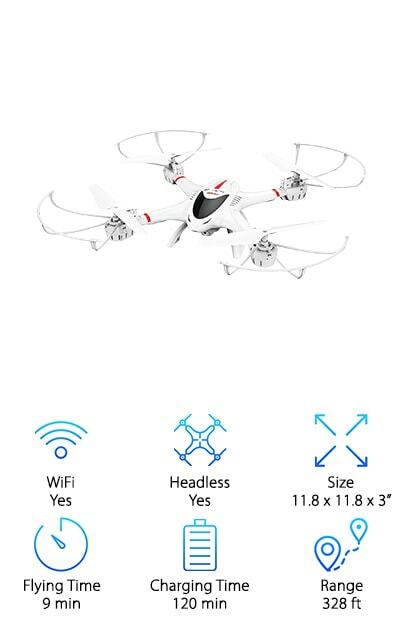 You can fly the drone without having to worry about its orientation. That’s not all. There’s a 3D flip and roll function that automatically sends the drone into stunt mode. And here’s something we really liked: it has 2 speeds. It’s a great choice for expert or newbie flying indoors or out. The DJI Phantom Drone is the best FPV quadcopter we found that’s equipped with GPS assistance. This is a great feature if you’re looking for a drone primarily for photography. Why? Because you don’t have to worry so much about where you’re going; the GPS will help you take care of it. The 720P HD real-time camera has multiple modes, too, so you’ll be able to get some really fun, interesting, and unique shots. Get this: the intelligent battery that’s included with this drone let it take flights up to 25 minutes long. That’s pretty impressive! The range is great, too, at 805 meters or a half mile. Plus, you can download the app and watch a live stream of what your drone is seeing on your smartphone or tablet. 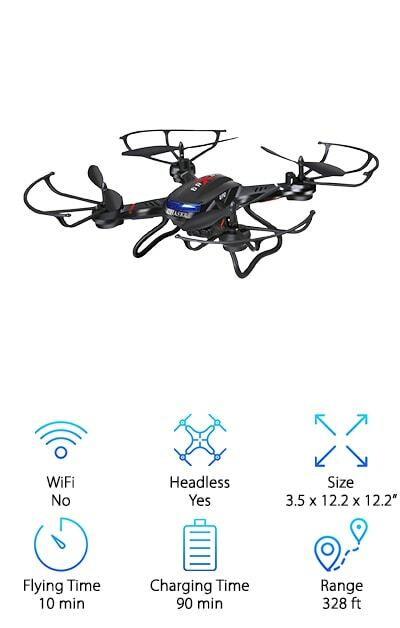 This is another great choice for best budget drone with camera. This TOXO drone has a lot of awesome features. For starters, you can control it with the included remote control that comes complete with smartphone holder. Or, you can download an app and fly it from your phone itself. The altitude hold feature is included with this one, too. Just let go of the throttle and the drone will hover and keep its current height. This is a great way to learn to fly a drone like this and an excellent way to make sure you never miss the perfect photo op. This drone is also foldable so it’s ideal for travel. Plus, one key take-off and landing and a headless mode make this a good choice for beginners. 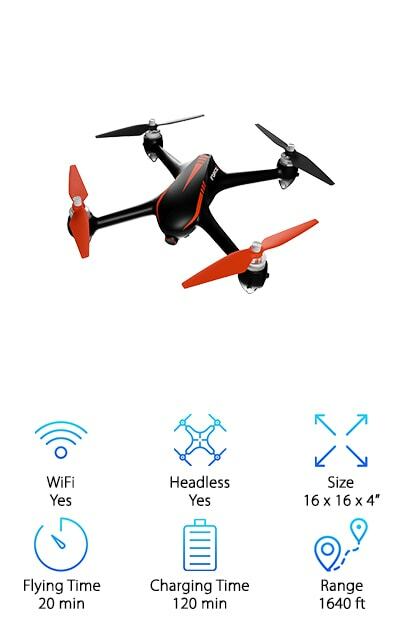 The AKASO A200 RC quad drone can be controlled with either the included remote or by using an app on your smartphone. If you choose to use your phone, be prepared for first-person, real-time images of exactly what your drone sees. It’s wi-fi enabled so the images get to your phone quickly and reliably. Because it’s foldable, it’s a great choice if you want something to take traveling. It’ll take up less space and be a little more durable in the folded position. Because of the built-in positioning system, this drone can easily return to the same spot it took off when you’re ready to land. All you have to do is press one button and it’ll come back to you. Oh, and there’s an altitude hold function, too. Looking for the best camera drone for kids? You’ve found it! 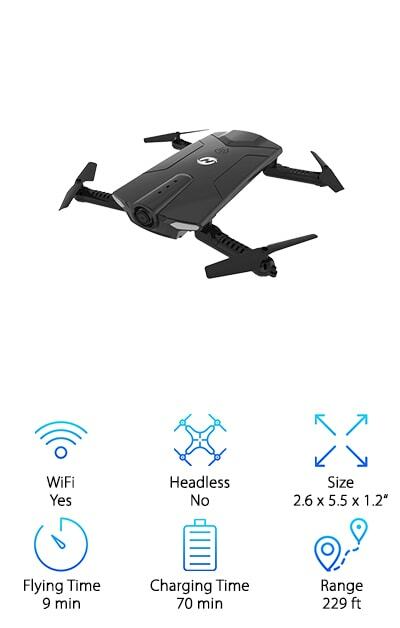 The Holy Stone HS160 FPV Drone is foldable, so if you want to travel with it, it takes up a lot less space than drones that don’t fold. The camera on this one is awesome, 720P HD to take amazing photos and videos while in flight. Here’s something neat, the photos and videos are saved in both the app and in a mobile album. The app is really cool, too, it lets you control the drone from your smartphone and gives you real time images. Plus, it makes it easy to share. One more thing: it comes with an extra battery so you don’t have to wait for a battery to recharge to keep flying. The Force1 Drone with Camera is great for both beginners and experienced flyers. For the newbies, it has 1-Ket Lift/Land, and altitude feature, and a headless mode. What does that all mean? It’s pretty easy to take off, land, and do everything in between. You can even hold altitude to take the perfect photo. And speaking of photos, the camera here is pretty rad: a 1080p HD camera. Pros will love the performance of the brushless motor and electronic speed control because it will push this drone ahead of its competitors. We mentioned the return home feature, but check this out. It doesn’t only do it when you want it to. If the battery power or signal gets too low, this one knows to bring itself home. If you’re looking for a drone that comes in an awesome kit that has just about everything you need, here you are. This best cheap quadcopter comes fully loaded and won’t break the bank. It’s equipped with a lot of great features, including altitude-hold for better control and rad picture quality. With one-key take-off and landing, this is a great choice for beginners. And for pros? They’ll love the stepless-speed function for seamless acceleration and deceleration. 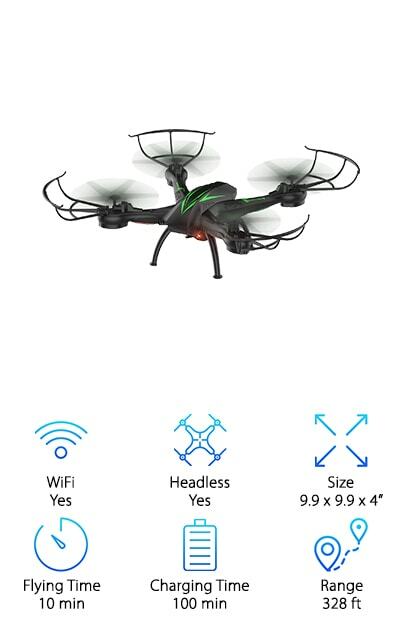 This makes this drone one that you can fly indoors or out and will help newbies get acclimated quickly. The 6-axis gyro system helps the flight stay stable and makes it easy to fly. Plus, it can do 360 degree rolls at the push of a button. And that just makes it awesome to fly. This RC Quadcopter from Kidcia is pretty user-friendly, which makes it a good choice for beginners. The remote actually has notes printed on it so it’s easier to determine what’s what. The live video feed can be displayed on your smartphone. You get an awesome first-person view and can easily adjust the camera. Headless mode orients to drone to the pilot instead of the pilot to the drone so it’s much easier to maneuver. And that’s not all. The one key return button will automatically make the drone flu back to the user which comes in handy because it less likely to be lost this way. Plus, the altitude hold function allows you to get steady, clear views for when you just have to take a picture. There are a lot of things to love about this drone from Beebeerun. One of our favorite things is how durable it is. Why? Because it’s made of ABS material that’s light, soft, and flexible. This one can take a bit of abuse which is why it’s a good choice for beginners. Beebeerun actually tests it to make sure it’s able to stand vertical drops, being pressed, and even having its blades bent up to 90 degrees. There’s more. 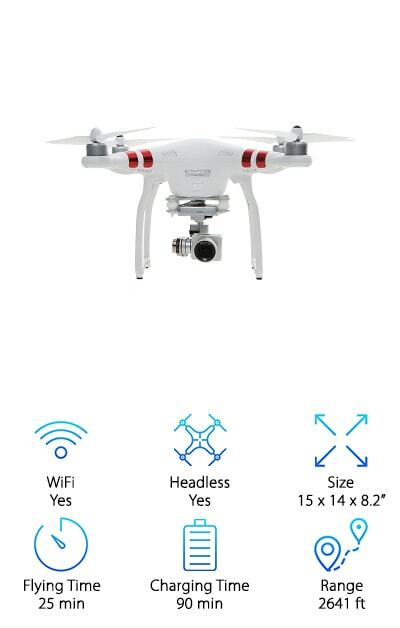 It’s also wifi ready so you’ll get real-time transmissions from the drone to your smartphone. And get this. It’s even compatible with a 3D headset if you’re looking for a truly amazing experience. It can hold its altitude steady and can even do barrel rolls at the push of a button.